Rob Douglas and Sue McNulty with their small company Wild Broccoli Partnership own Simply Wild Journeys. Simply Wild was originally formed in 2005 by four partners, and began operating in 2006. Now we offer over 40 different adventure scenic trips across the wonderful landscape of the top of the South Island of New Zealand, walking and hiking, cycling and mountain biking, sea kayaking and sailing, rafting and scenic, plus combinations of all, by helicopter, boat and vehicle. Our trips are often logistically complex over a wide range of landscape and activities, with luxury level clients who have high expectations of us. We have a comprehensive safety plan which was externally audited when we began in 2006, and we continue to be audited by NZ’s quality audit programme, Qualmark, each year. 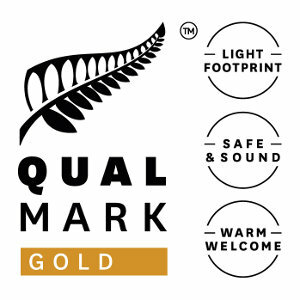 We are currently graded Gold standard by Qualmark. We aim to engage on a personal level with our clients, and because our trips are private, be spontaneous and flexible, while being highly professional in our preparation, presentation and organisation. We want our clients to feel like they have spent time with friends (who are safe, professional and knowledgeable about our landscape and culture). Apart from Simply Wild Journeys, Wild Broccoli encompasses Broccoli Row Cafe, and Simply Wild Events, a corporate events brand. Rob is CEO, part owner and chief guide, and had 22 years experience in senior market, management and governance roles in large multinational and national companies in New Zealand and Australia before setting up Teamworks New Zealand, a corporate training and development consultancy offering organisational development, leadership and team development, which operated for 20 years, with a partner, John Stuart. 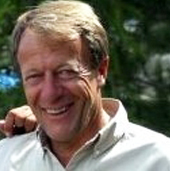 He has always been passionate about the outdoors, with 30 years formal experience in designing and creating safe and enjoyable outdoor experiences, firstly for corporate leadership and teambuilding adventure experiences across New Zealand and East Coast Australia, and for the last 10 years as chief guide for Simply Wild. He was a trustee and board member of the Whenua-iti Outdoor Pursuits Trust for 10 years, is now a trustee of the Nelson Tasman Cycle Trail Trust, and has extensive interests and experience in the outdoors. Sue (the one in the middle) with some of her Broccoli Row team. Sue is Rob’s life partner, and she started the iconic Broccoli Row Cafe & Restaurant 25 years ago in Nelson. She graduated with distinction to qualify as a London City and Guilds Chef in 1988 from Christchurch Polytechnic and subsequently worked in senior chef positions in Christchurch, London, Perth and Nelson before establishing Broccoli Row in 1992. Apart from being part owner of Wild Broccoli, Sue designs and creates with care all our food for our day and overnight trips. She’s passionate about food, family and flowers, and is a keen volleyballer and mountain biker. Our guides Sally, (on the left) Emma (on the right) and Charlie and have all travelled extensively and are experienced in guiding/hosting luxury level clients. Sally’s profession is as a physiotherapist, but she has always had a love of the outdoors and her hiking experience includes many multiday trips throughout the South Island, north Island Central Plateau, Annapurna and Everest regions of Nepal, Utah, Idaho, and Nevada in the USA. She has completed alpine mountaineering courses and Summited Mt Ruapehu, Mt Ngaruohoe, Mt Tongariro, Tapuae-o-uenuku, Mt Philistine, Mt Murchison plus many smaller peaks particularly in the upper South Island. She also has experience in caving and has been an adventure racing and mountain bike race competitor. Emma has guided with us for 10 years and had previously travelled widely and guided in South America. She has a small inbound travel business, New Zealand Travel Designers, was a national competitive mountain biker for a number of years, and also has a successful business called The Wheel Woman, teaching women and hildren how to mountain bike. No story about Simply Wild would be complete without an acknowledgement of the three originals (plus Craig Wilson who came later) whose energy time and money helped to start Simply Wild with me. Tim (in the green) is a a senior financial accountant who kept us focused, created great systems and is an excellent team person. He also guided in early years. You will see Andrews (on the right in white) superb photos throughout the website. He is actually a veterinary surgeon with his own large practice, but his passion (and was his profession in Europe and New Zealand for some years) is photography, and has captured some great images of the Nelson region. Jeff (on the left) is a real estate agent with a passion for mountain biking and was ever enthusiastic about Simply Wild and its purpose. Craig who came later and has a tourism background, gave us indepth knowledge of the industry and how to market Simply Wild. The remainder have been taken by Rob. Our photos have been taken over the 12 years we’ve been operating, and you will see helicopters or boats/yachts in the galleries below the products, that we’ve used over the years, which we may not use now. The photographs are designed to give you an idea of what we do and what we’ve done, and are all genuine photos of our trips taken on our exploratory or real trips, not posed for publicity with models. We hope you enjoy them. We're passionate and have 10 years of experience at catering to the discerning traveller, and many years of experience in the outdoors. We've all travelled fairly extensively ourselves, and we have a clear idea of the kind of experience we want to create for our clients. 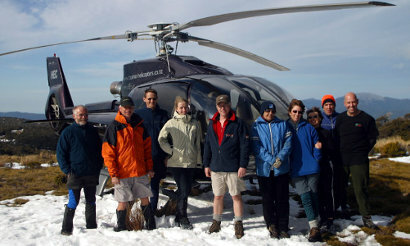 Our guides are friendly, safe, knowledgeable and focused on helping you make the most of your holiday in New Zealand. Simply Wild Journeys offers only private, premium and luxury experiences, many of them unique and we are unusual in offering such a wide range of activities across a such a varied landscape. Our private trips mean you can make the most of your time in Nelson. We also understand that travel is a personal and subjective experience, and that our ability within reason to be spontaneous and flexible, can enhance your holiday. You can customize any of our day or multiday journeys to fit your individual travel preferences. Our knowledge of the area and the wide spread of activities we provide, means we can personalize a trip to your interests, and level of activity you prefer. We had the services of Rob and his team for three very different days - help hiking, biking, and a cruise on the waters! Each was conducted with considerable efficiency, great passion, much laughter, and overall attention to detail leaving us, the guests, the chance to just enjoy the experience. We cannot praise him and his team - Sally, Sue and Tim - too highly. Am I the first one to write a review of Simply Wild? If yes it's really an honor. Rob Douglas is one of the best wildlife guys I've ever met, experienced, knowledgeable and amicable. Also the helicopter service he uses is very, very trustworthy). Rob took us helihiking on a trail behind Nelson and explained about the history and the nature. What an enjoyable day we had with him. Having traveled the world experiencing the unique like hiking the Ausangate in Peru, climbing Kilimanjaro twice, crossing by car the Pakistan/China border, overloading from Tangier to Mombassa, etc., Rob and his crew created an unbelievable a multi-adventure trip that was fantastic! Mountain biking down a 12-mile trail from atop a 3,000 foot mountain reached by helicopter, walking two of the most unique New Zealand's treks, unparalleled service proactively meeting every need, including transferring by helicopter my friend between trek sections when his foot caused him problems, excellent guides who catered to our needs and interests, amazing meals in the middle of nowhere, adapting immediately to situations not under anyone's control due to weather such as paddling a Maori waka when a storm prohibited our overnighting on a yacht, and the list could go on and on. Unlike any physical activity we've ever done and would not have missed it for the world! Thank you.